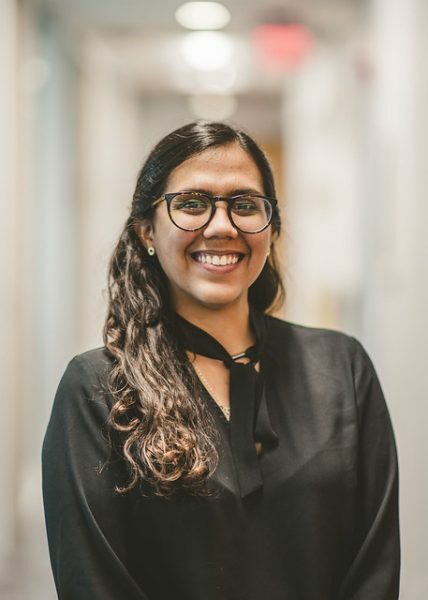 Luisana Zambrano pitched her business, which would help immigrants grow their own business, to judges at the GOJA-iChange FIU Social Innovation Challenge on March 27, 2019. After seeing her friends and family struggle to find work as immigrants, Luisana Zambrano, a senior studying international relations from Venezuela, decided to work up an initiative to empower immigrants to open their own businesses. Zambrano and four other groups of student entrepreneurs culminated a full academic year of ideation, learning and experimentation at the GOJA-iChange FIU Social Innovation Challenge final pitch event March 27. The event came as part of Changemaker Week: a university-wide initiative to engage students in social innovation and entrepreneurship offered by the Office of the Provost, the Center for Leadership and Service, the Honors College, the Office of Global Learning and StartUP FIU. Zambrano and participating students pitched innovative solutions to complex social issues in front of judges for the chance to win one of three prizes to support their project. Understanding the poor working conditions for flower farmers and retailers, Zambrano decided to take action to improve conditions and odds of economic stability for immigrants in the floral industry, especially in Miami. She telecommutes with her “tribe” — her mother, who works in the floral industry at home in Venezuela. Zambrano hopes to offer training and resources to immigrants, such as how to create beautiful floral arrangements; how to find ethically grown and imported flowers; and manage finances. For students interested in pitching their ideas at next year’s competition, Zambrano said they should always write down their ideas, allocate time to work on them and talk to the people the solution should serve. “I see my family and friends who struggle with this, so I felt that this is an opportunity to make a change in their lives,” Zambrano said.